to move toward or be attracted to a person, place, or thing. It took me the last 8 days to conjure up a title for what I consider to be my most important blog post to date. To be fair, this is record timing because it could have been 8 weeks, 8 months, or never. I chose the title gravitate because I wanted to focus on my fear so that I could push past it. I chose gravitate because I want others to be attracted to my message. To believe in it and share it across multiple mediums because I have no doubt that my thoughts are shared by many. What I am about to share is the emergence of my labour of love. A piece I have put my heart and soul into, and quite possibly my most vulnerable one to date. My name is Alex McGillivray and I am an athlete. I run, I swim, I bike, I yoga, and I’ve played a variety of recreational sports from rugby to basketball. I’m also super proud of crushing two of my own big, hairy, audacious goals for 2015: running my first 30km race, and shelling out hella-awesome cheers as a Pace Beaver for Seawheeze. Here’s the truly awesome part. I’ve accomplished all of this at 235lbs – all 235lbs of my authentically raw self. I am so overwhelmingly grateful for the encouragement and acceptance of both the running and lululemon communities. I have always loved the message that lululemon emits into the world; the inspiration that they instill in people. Some of the best people in my life either work for, or are ambassadors for your company. But despite all of this positivity and support that lululemon provides, I feel like you are missing out on an incredible opportunity to grow your community through your products. I don’t want this letter to be perceived as negative because that is not my intention. I have experienced nothing but support and even inspiration when entering your stores. I have always loved the messages of your manifesto; my aboslute favourite is, “do one thing a day that scares you”. But I have also felt that for some, it comes at the cost of being exclusionary. For a company that prides itself on being inclusive, and supportive of others, it doesn’t always feel this way. Being the optimistic ray of sunshine that I am, I see this as an opportunity. I want to know why the company that encourages people to step outside their comfort zone and embrace those hair raising fears only makes clothing for specific body types? If love is at the core of lululemon – love of community, love of sweating together, and love of practice – then why not extend that love into the body positivity movement and lead the way in creating components for ALL athletes/people to live long, healthy, and fun lives? There is no doubt that my body has changed in ways I can’t even see from moving in a way that I am beyond passionate about, and while I am fortunate that my body shape is accommodated by some of your clothing, I still have a hard time fitting into everything. My broad swimmer’s shoulders and rib cage have a hard time fitting into your jackets, and my (almost Beyonce-like) glutes I’ve earned from countless speed workouts also have a hard time fitting into some of your pants. You currently carry up to a XXL in your men’s gear which is ah-mazing, but a bit unequal to us girls. You already help out the bustier girls with the Ta Ta Tamer in your sport bra line-up, but I think it would be the bomb dot com if you extended your women’s sizing into your entire line. It isn’t hard to understand that women want to feel and look good while exercising. You’ve already figured this out since you make awesome top quality gear that comes in a variety of colours and styles. Shout-out and utmost respect for the Speed Tight. Those babies are my absolute faves! I’m going to tell you something you already know: if women feel they look good, they are more motivated to become and continue to be active. I can personally attest to this fact. When I first started my journey, I was 45lbs heavier and HATED the way I looked in EVERYTHING, let alone awkward workout gear. I found it very difficult to break down the barrier of my appearance and how I would look in public until I gained more confidence and lost enough weight to fit into more stylish workout gear. If I had more stylish gear from the beginning, it would have given me some extra motivation to reach my health goals. One of the things I love about your gear that I think larger female athletes would love is that a lot of your fabrics hide a myriad of self-conscious body issues while providing great comfort and support to boot. Your Luxtreme fabric is a great example. I am also a huge fan of the Rulu fabric. If you were to create larger sizes in the products that use these fabrics and offer them as part of your brand, you would corner the market on other plus size competitors like Nike, Athleta, Old Navy, Fabletics, and most recently, Forever 21’s new plus size athletic wear. I say this because I truly believe there is nothing out there that compares to the fabric and quality of lululemon gear. A case could also be made for 2015 being the year of showcasing larger female athletes. In particular, the emergence of several fierce women braced the covers of multiple magazines (Women’s Running, ESPN to name a few). There are also countless Instagram accounts of hella cool plus size women practicing a wide variety of athletics (check out @leebee2321, @abingson, @borntoreignathletics, @nolatrees, @biggalyoga, @superfithero). Almost every article printed or Instagrammed picture contains reference to the gear and where to buy it. This would be a completely new market to dive into that could generate a magnitude of sales and positive publicity. I understand that mainstream media preaches that we must obtain a perfect body, but the body positivity movement is taking the world by storm as people are learning to self-love and find their confidence. 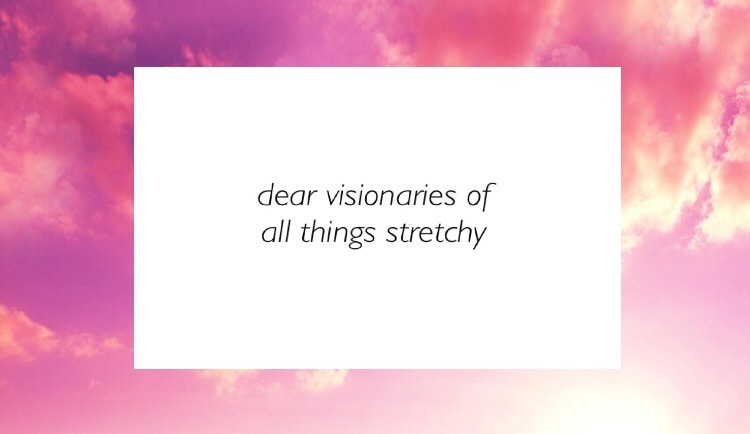 I think that as a company founded on the principles of yoga, it would be amazing to put those values of yoga to work within the body positivity movement for everyone. The one that stands out most for me in this particular case is Ahimsa, which as you know speaks to one’s self-criticism, overcoming it, and extending that sense of compassion to others. Life is too short for us not to love ourselves as we are, or while we try to reach new fitness heights. I know that you have a loyal following that extends beyond borders, and I know you have probably received countless letters and requests to create larger sizes for women, but I can only hope that this letter is different. I hope that my love, passion, and vision are genuinely felt through my words. As Mahatma Ghandi once said, “Be the change you wish to see in the world.”, and one of my new big, hairy, audacious goals is to be that change. I want to be the positive driving force of product changes within lululemon for other women who I know are feeling and thinking the same things I am. As someone who fully supports lululemon and what you represent, I envision this as an opportunity for incredible innovation and connection to happen. You can connect with me through my blog (sneakerdrive.wordpress.com), Instagram (@sneakerdrive), or find me in the flesh at Seawheeze. I can’t wait to hear from you or see you soon! Well, there it is. Universe, it’s in your hands now. Wow. Thank you so much for your positive reply to my post Margaret. I took a trip over to your website and I was inspired by the work you are doing to help current and past athletes. If there is any way I can help or contribute, I would be happy to do it. Looking forward to hearing back from you and again, I’m so grateful for your support.